It’s hard to believe that 2012 is almost over! And with the end of one year, comes planning for the next! So this month, we’re going to offer some thoughts and tips to help with your new year’s planning. And we'll start with membership renewal planning. I admit it. I don’t have enough hours in the day. I believe in my professional association. I know it’s an important network and a resource to help me do my job better. But when it comes to making time to “engage” it falls off my plate as something that won’t kill me if it doesn’t happen today. Day after day, engagement falls to the wayside until a topic that arises that I’m so passionate about that I spring into action. I’m really busy, and sometimes I forget things. My inbox runneth over, so be careful what you e-mail me. I need what you have, but don’t make me hunt for it. I want your support – when, where, and how I need it. *Hat tip to Ernie Smith (Associations Now) - where I discovered Alex Mouw’s post. Frequency – Like it or not, people forget to renew. Don’t give up too soon on retaining a member. Channels – Use all of the tools that are available to you for retention – mailed notices, postcards, email, staff or volunteer calls, telemarketing, and website interstitials. Conversion – Almost always, first year members are the least likely to renew. That’s why the first year of membership is called the conversion year. Focus time, effort, and budget on these first year members. 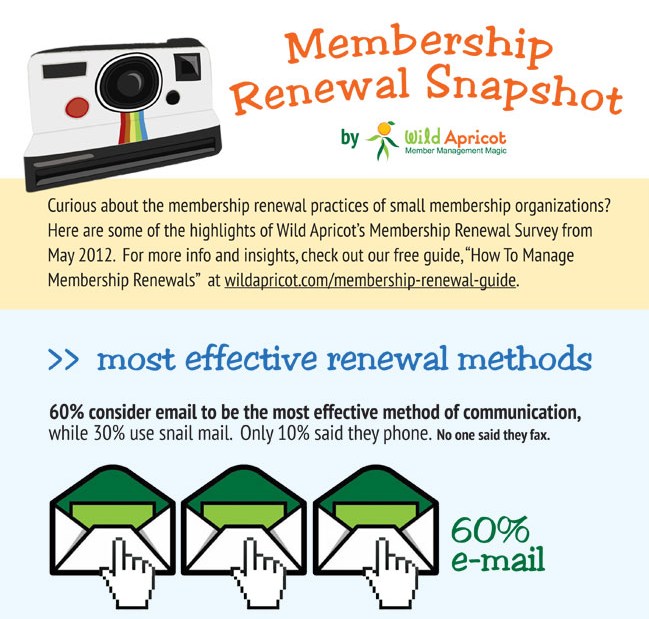 We’ve created a renewal guide – How To Manage Membership Renewal: Tips and tactics for small membership organizations – which offers an overview of current practices as well as tips on how to: start the renewal process; determine the number of renewals; choose effective communications methods; and acknowledge renewals. It also includes information on: incentives and discounts; grace periods; automated renewal processes and thoughts on ongoing engagement and retention. Do you have any tips for membership renewal planning for 2013? Share them in the comments below.